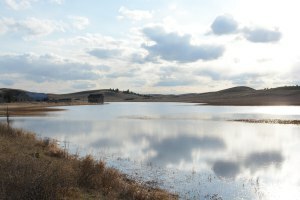 Pools of water scatter throughout the Cheney fields in springtime, and drivers cruising by can spot anything from ducks and swans fueling up for their northern journey to bald eagles flying overhead hunting for prey. What they are witnessing is only a small sample of the tremendous amount of bird species accumulating in the channeled scablands in Eastern Washington, which is the ideal place for thousands of birds to funnel through as they migrate back up north for the summer. Freshwater wetlands, like the ones surrounding Cheney, cover only 1 percent of the Earth, yet they hold more than 40 percent of the world’s species and 12 percent of all animal species, according to Ducks Unlimited. Out of over 900 bird species in North America, about 138 species in the conterminous United States rely on the wetlands. “Wetlands are one of the most important, if not the most important, habitat on the planet,” said the manager of conservation programs at Ducks Unlimited, Chris Bonsignore. This year in particular has seen a high amount of birds in the wetlands of Eastern Washington. The bird species in the area are dependant on the weather, Bonsignore said, and due to the high amount of late winter snow, followed by higher temperatures and rain, the wetlands filled up more than in previous years. The wetlands are created from melting snow and rain runoff, and Bonsignore said the way it happened this year was perfect. This creates a unique habitat that supports animals of all kinds, including amphibians, weasels, moose, beavers, songbirds and many kinds of waterfowl, Bonsignore said. Mike Rule, a wildlife biologist at Turnbull National Wildlife Refuge, said that thousands of waterfowl species travel through the area as part of their migration up north, and the more the wetlands are filled, the more species of birds there will be. Rule said a good example of this is Tundra swans. While these swans nest in the Canadian arctic and not in Eastern Washington, they will stop in Eastern Washington’s wetlands on the way to their nesting habitat. Waterfowl, like the common Mallard duck or the less-common American widgeon, use the wetlands to load up on seeds and aquatic insects in order to take in the protein, fat and calcium they need for egg laying. Many of these species are migrating up to Canada. One species that has begun to nest around Cheney, however, is the bald eagle. Rule said that in the past, bald eagles would migrate to the area in the fall and possibly stick around for the winter before moving off to their nesting ground. But over the past few years, Eastern Washington has hosted nesting bald eagles. The eagles are happy to see an increase in waterfowl, too. Rule said eagles will sometimes prey on ducks, and when waterfowl numbers increase in the area, like during spring and fall migration, more bald eagles are likely to be seen. “I’ve actually seen them sitting perched in a tree with a duck in their talons,” Rule said. “They’ll kill a duck without any problem whatsoever.” Bonsignore said that Ducks Unlimited is working with places like Turnbull to increase the amount of wetlands. He said that since the 1900s, many of the wetlands have disappeared.